"Santa visits animal shelters too, right?!" Freedom Harnesses are very similar to Easy Walk Harnesses, but they allow for the option of a back clip and more adjustability for different body types. For anyone that has ever walked or seen a WAG dog out and about, we love the non-invasive front leader option, with the secondary back clip option for those who do not need the front clip. Most dogs love to chew on a yummy bone, it's natural! Shelter dogs are no different, and because they may have less access to stimulating things than a dog that lives in a good home, bones become especially important at WAG for entertainment, calming, gum stimulation, and more. From specialized veterinary appointments to events, WAG occasionally needs to travel in the name of animal rescue! Your donation of a gas card will help us get there! Baby gates are a daily part of life at WAG, as many pet owners will understand! We have just recently discovered to joys of Swinging Door Baby Gates, which eliminates the need to always be hopping over top of them - what an invention! We are now looking to permanently install them in many of our doorways, to help keep our dogs and cats safe! The cats and dogs at WAG have put together a wish list for the hoooowwwlidays! They have lots of toys and treats on their wishlist as well as some things to improve their temporary home at the shelter. 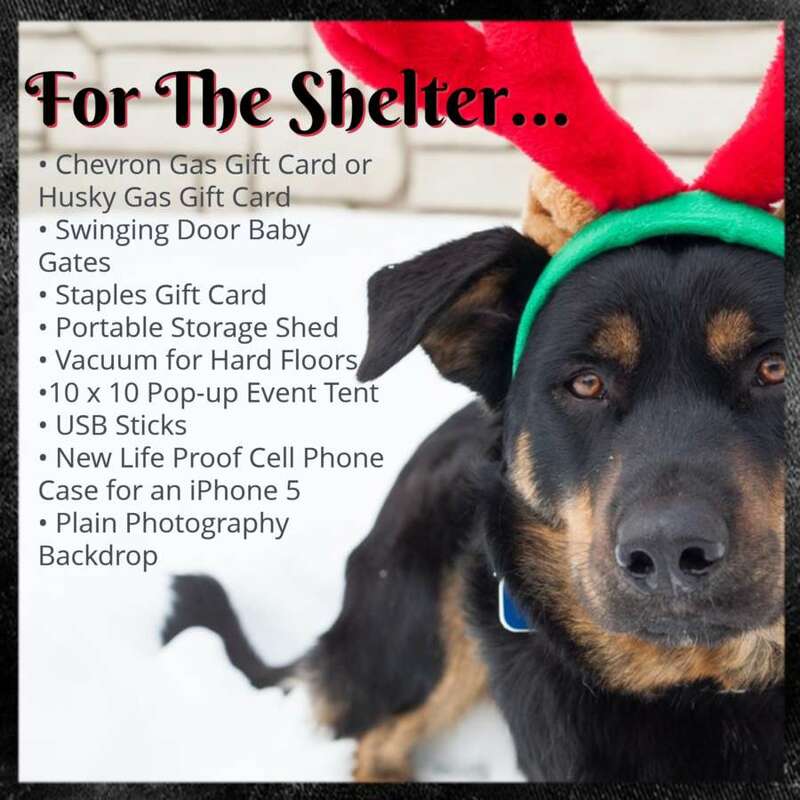 If you purchase something from WAG'S Wish List and bring it to the shelter on Saturday, December 16th or Sunday, December 17th anytime between 1pm - 4pm, you can present your gift to a WAG animal (in Christmas apparel) and have your photo taken! Have your photo taken with them, add your gift to our Christmas tree, and watch for updates from WAG on Christmas Day when the shelter animals (with the help of staff!) will open their gifts! Photos will be posted at the end of each day for your downloading pleasure! Tax receipts will be available for items purchased over $20 (before tax) with the original receipt.